September means back to school! Homework, field trips permission slips and school announcements will be flooding in! With the constant stream of information and questions, it’s easy to become overwhelmed. Luckily JCFamilies swoops in to save the day! Don’t worry not all heroes wear capes! 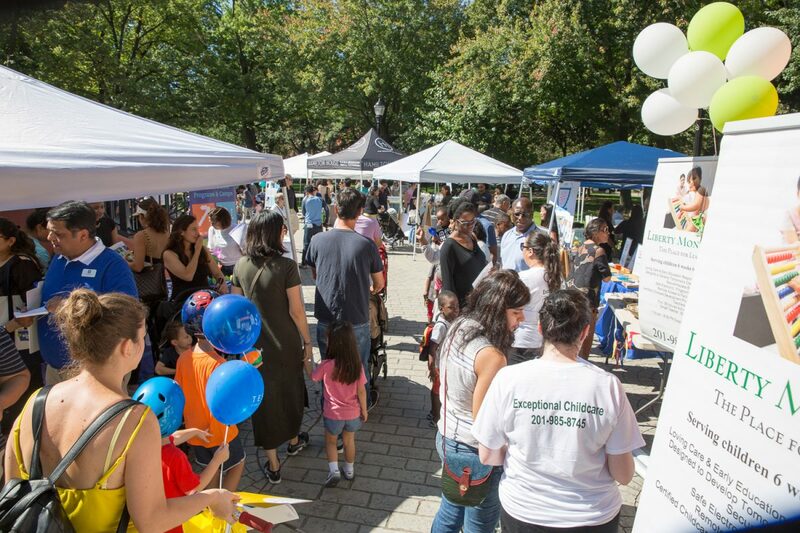 Our annual JC Education Fair kicks off September 22nd from 10 AM to 2 PM in Hamilton Park and it is your one stop shop for all things education in Jersey City. Not convinced? Here’s a list of five reasons to attend the annual JC Education Fair! 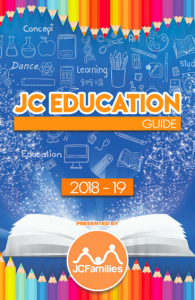 Before you explore all there is to see, make sure you make a stop at our JCFamilies table and grab your free copy of the Education Guide detailing the types of educational options available to families. Private, Public and Charter schools will be participating in the JC Education Fair! You can see the list of all schools, daycares and activity centers participating in the event here. 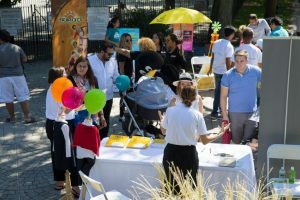 The JC Education Fair is the only fair in Jersey City where you can gain firsthand information about and speak directly to the representatives of major schools, daycares and activity centers in and around Jersey City. Parents will have the opportunity to not only learn about the different school systems but also become aware of language programs, special events and many more extra curricular activities available for students and their families. 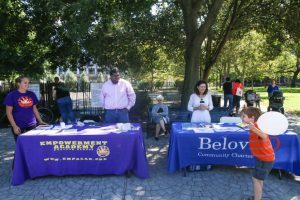 Hamilton Park is an amazing setting to stretch your legs and engage with fellow members of the Jersey City community while learning about all the school options provided! This is the perfect time to share personal experiences and opinions with other parents and pass along recommendations. Your little one won’t be bored while you pick up school pamphlets. 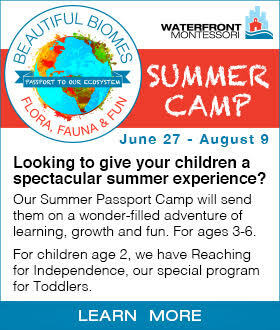 While parents learn about schools, kids can enjoy the amazing entertainment! This year there will be a “Magician Face-off” featuring three amazing magicians! 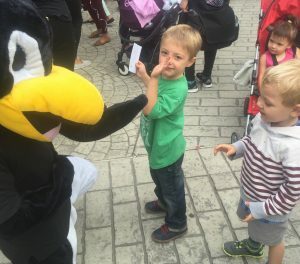 Your children will marvel at the talents of Cisco the Magician, Chiqui and Orland from Silly Willy Magic! Parent’s don’t forget to use the hashtag #JCEducationFair with any photos or videos taken at our event! Want to learn more about JCFamilies and how to get involved? No problem! 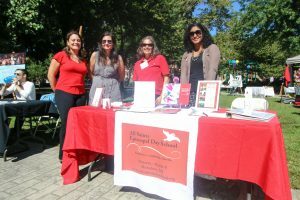 JCFamilies is always looking for volunteers and blog writers! 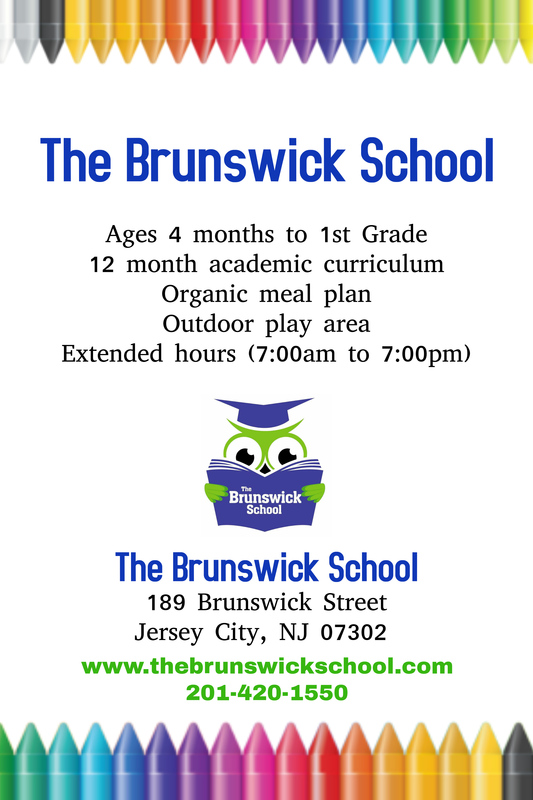 We also hold many events for parents and kids in and around Jersey City. While you pick up your Education Fair guide, ask one of our JCFamilies representatives about how you can contribute and become part of the family! If you are a business looking to sponsor or advertise with us, you can email us at [email protected] and someone will be available to help. WHEN: Saturday, September 23rd. 2017 10a.m. to 2p.m. 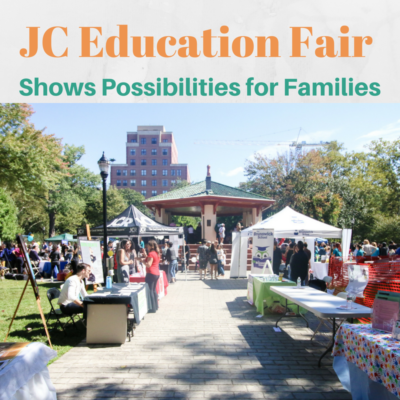 Jersey City, NJ, September 23rd, 2017 – JCFamilies will be launching and distributing their new directory at the JC Education Fair 2017, which will cover all bases for parents and families interested in local schools and day cares. 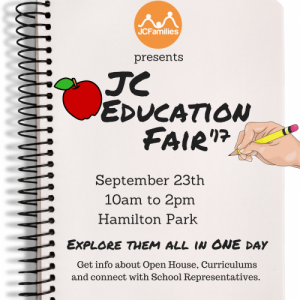 Over 57 Jersey City and Hoboken-based public schools, private schools, charter schools, and day cares will be represented at the upcoming JC Education Fair 2017 where parents and families can obtain information firsthand from school representatives on open houses, school curriculum, as well as intermingle with other families and educators alike. 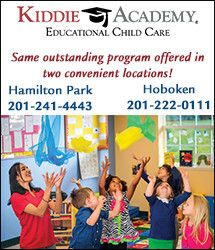 Parents will not only learn how to better navigate the different school systems and calendars, but also become privy to special events, enrichment classes, promotions and obtain resources from some of the leading childcare facilities and most prestigious schools in and around Jersey City and Hoboken. Schools like Hamilton Park Montessori, The Ethical Community Charter School and AlphaMind Academy will be in attendance for this family-friendly event that will appeal to children of all ages. 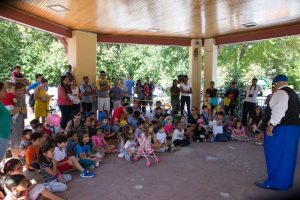 JCFamilies will be hosting the 2nd Annual ‘Face-Off’ Magic Show, a free program showcasing the marvelous and mystical talents of local Magicians for all to enjoy. 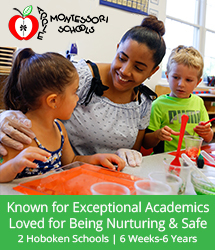 Parents will be able to walk away from this experience able to discern which school will be the right fit for their young scholars and families. Team members of JCFamilies will also have a table set up to answer any of your questions, and we will be distributing our newly-launched directory for the 2017-18 school year. Stop by and say hi! 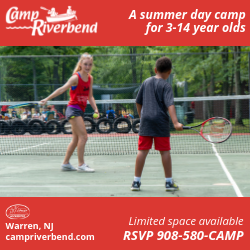 For additional information please visit our website and subscribe to our weekly newsletter to receive event updates. *JCFamilies is a not-for-profit organization that connects over 25,000 local parents through its various channels, providing information, resources and wholesome parenting experiences to local communities. 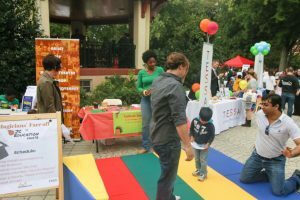 JCFamilies is the largest and fastest growing community of parents in the Jersey City area. Now that we’ve officially entered October, we call breathe a sigh of relief that the school started without a hitch. (At least not one that shut us down.) Routines set, at least for now, we can reflect on that pile of papers, folders, and pamphlets we collected at the JCFamilies Education Fair. (SO GLAD I didn’t have to do all that research on my own.) But first – the magic. I hadn’t seen a magician since I was a kid, so when I saw the line up, I invited the neighbor’s kid to join me and my two. (He likes witches; I figured this was up his alley. It was.) To say that they (boys, ages 3 & 4) were mesmerized would be inaccurate; mesmerized is quiet. In fact, my crew was so excited that their little bodies looked like popping corn or tiny fireworks. None of the kids could sit still. Their animated sense of delight put me into that rare mental space that boasts “See? 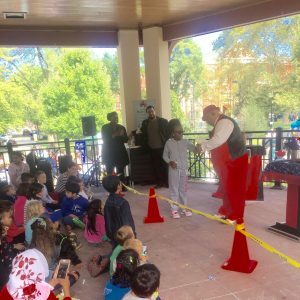 This is why people have kids.” Suffice it to say that hiring a magician for an event, or better – sending kids to magic school – is now on my list. I did know before I arrived that lots of schools (public, private, charter, and early learning centers) would be represented, but I was shocked to see how many educational services and resources were also in attendance. 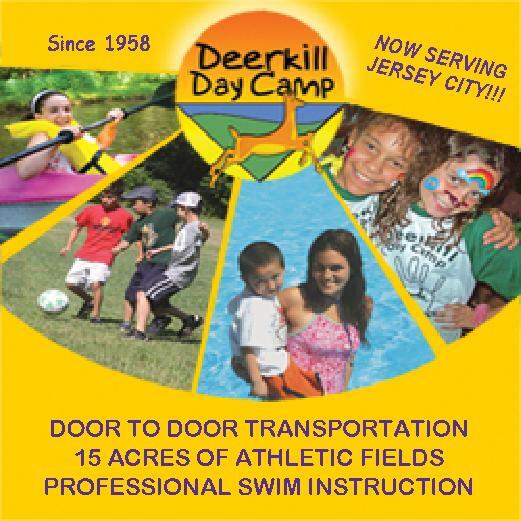 We talked to summer camp directors who showed us photos of happy swimmers and informed us about busing options. We galloped on imaginary horses with the chess school and shook hands with math and science program representatives. 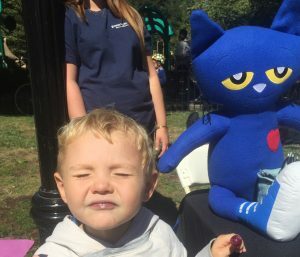 We high-fived a penguin and took a selfie with Pete the Cat. 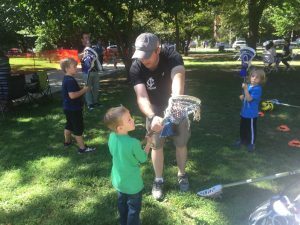 My entire crew had a turn with the lacrosse sticks (I’m sure there’s a term for what they were doing) and they got Halloween stickers from Hudson County Community College. I took home folders about savings accounts for kids. I was glad I brought a bag – I picked up lots of information from of different people. Of course we had to go to the playground before we left (even though one or more of my crew was getting nap-time cranky) because Hamilton Park is awesome, so I sat on the rock wall while the kids ran around. I watched the fair buzz with, I dunno, thousands? of families strolling from table to table, casually collecting options for their kids who are lucky enough to live in what must be the greatest city in the whole of America. It was amazing to watch. And then I saw the JCFamilies table, where the team was handing out paper copies of their fresh-off-the-press Education Guide. I couldn’t hold back the hug – my kids were happy. I also felt empowered. The Education Fair was a real awakening to the exceptional amount of options that exist for our kids so close to home. Options that never would have occurred to me. Like lacrosse. Magic.